Last night, E Corp celebrated the launch of their cryptocurrency, Ecoin. E Corp CEO Phillip Price (Michael Cristofer) addressed the crowd in New York’s Terminal 5 to unveil the national launch of Ecoin: A new currency for a new era. E Corp is trying to place the events of 5/9 behind them and introduce Americans to the newest form of currency. However, midway through Price’s speech, fsociety hijacked the stage and reiterated their discontent over E Corp’s latest attempt to ruin society. Ecoin is just another way for them to control society. 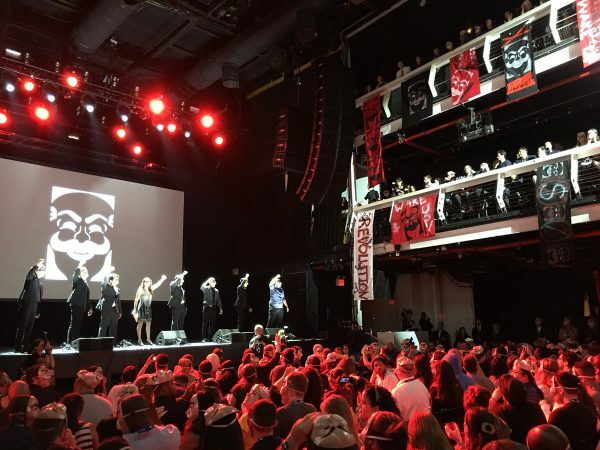 Fsociety banners and sympathizers filled the venue. Chants soon followed and Price was quickly escorted off the stage. That’s when the real fun began. 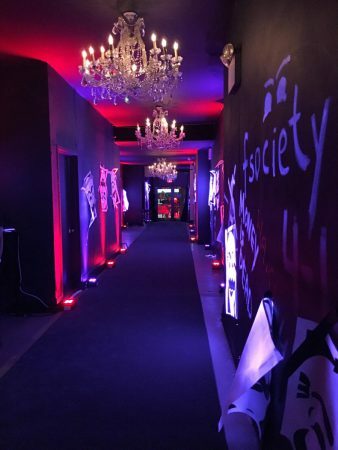 Throughout the party, fsociety was slowly converting attendees. Passing around masks and giving secret instructions to everyone that would later lead to the eventual reveal and brilliant execution. Sure, while we all might have been there to celebrate the launch of Ecoin, what we got by the end of the night was a sneak peek at Mr. Robot’s season_3.0 premiere episode. The show continues exactly where the previous season left off: Elliot (Rami Malek) is shot and Darlene (Carly Chaikin) is still reeling after the death of Cisco (Francis Shaw). The gang is reunited as new characters and plans are revealed. However, will everything go as planned or will Elliot go rogue again? The Ecoin launch party will go down as one of the best New York City Comic Con events we’ve ever attended. The entire party felt like a Mr. Robot episode. Attendees knew something was going to happen but getting surprised with a screening of the premiere episode was the icing on the cake. And if this party was any indication of how crazy season_3.0 is going to be, then we’ll gladly accept it. season_3.0 airs Wednesdays 10/9c on USA Network. Please check your local listings for channel information. You can keep tabs on both fsociety and E Corp on Facebook, Twitter and Instagram.